Finally the full retinue is ready to take to the battlefield. 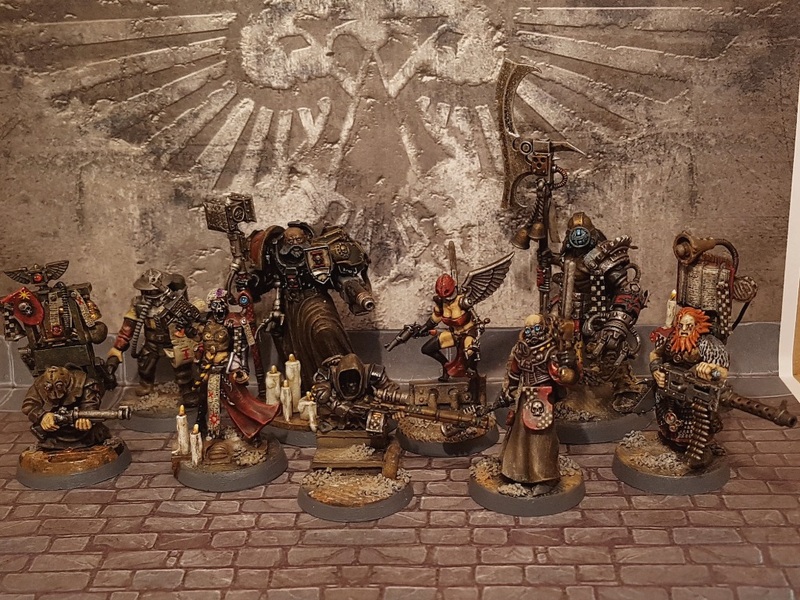 It has been years since I played anything remotely GW, but we have a game coming up next week - and I can't wait to get this lot on the tabletop. Backrow left to right: The Goose, Inquisitor Lord Rodrigo Menéndez de Márques, Seraphim, Bäel The Beheader. Frontrow left to right: The Hunchback, Sweet Death, Double Tab, Dr. Nikolai Anatoly Pajari, The Diciple. Great photo of an awesome-looking group! The limited palette is really effective, & I like that it has warmer tones than you often see in 40K colour schemes. Absolutely lovely stuff. The two standouts to me are Double Tap and The Beheader. Superb group! Hope you're able to get some snaps of them in action. I'm always glad to come to your blog. It's so full of eye candy and inspiration it makes my week.